Well, it's sure been a long time since I've written a book chapter. Code Happy was released almost 12 months ago and amassed a total of nearly three thousand sales. Let's see if I still remember how to do this "writing" thing. If you have read the previous title you will already know that I am firstly a developer, and secondly a writer. For this reason you won't find any long words in this book. Nothing that would impress Shakespeare (apart from the spelling errors?). 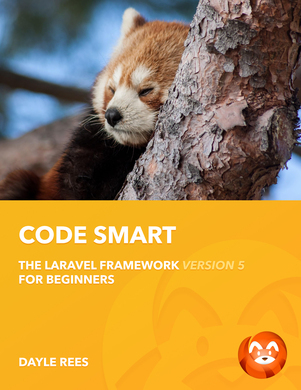 What you will get is straight talking, simple to understand information about the Laravel framework. You will also get passion! Not the sweaty bed sheets type of passion, but enthusiasm for the Laravel framework which cannot be rivalled. I like to write my books as if I were standing right in front of you having a conversation. In fact, if you really want a conversation then come and see me in the Laravel IRC channel! Now it's time for one of those little 'about the author' paragraphs. No one really wants to read it, but it never hurts to stroke the ego a little, does it? My name is Dayle Rees (it says so on the cover!) and I am a web developer and a design enthusiast. I come from a little town on the coast of Wales called Aberystwyth. At the time of writing my last book 'Code Happy' I worked for the National Library of Wales in Aberystwyth, which is one of three copyright libraries in the United Kingdom. I have since moved to Cardiff, which is the capital city of Wales and have started working with BoxUK. BoxUK is an internet consultancy and development organisation in which I get to work with a team of developers who are passionate about the world of web development. Web development isn't just my work, it's also my hobby. I enjoy finding useful and interesting pieces of code or beautiful designs. I believe that our skills let us do wonderfully creative things, and I love seeing ideas come to life. A little over a year ago I began helping the Laravel community with bundles of code, web designs, and helping out any way that I could. Since then my involvement has increased. Laravel is now my primary open source project and I am now a member of the core development team for the framework. With Laravel 4 (codenamed Illuminate) my involvement has hit a new high. I have been working alongside Taylor Otwell to make this release the best framework that you will have ever used. Don't take my word for it! Start using it and thank us later when you can't stop smiling while coding. Laravel is an example of how even a development tool can be creative. Laravel's beautiful syntax straight from the genius mind of Taylor Otwell cannot be rivalled. It enables us to write code that will read like nerd poetry, and will allow us to enjoy our coding tasks. So Dayle, what has changed since the last release of the framework? The simple yet confusing answer is everything and nothing! Laravel 4 has been rewritten from the ground up, allowing for increased flexibility and testability along with a billion (not entirely accurate - don't count them) new features. Where Laravel 3 gave you some freedom with how to structure your code, Laravel 4 will allow hackers to go wild and change the framework to suit their needs. When I hear that something has improved I am always looking for a catch, but with Laravel 4 there isn't one. It still has the beautiful and expressive syntax you love; you might even find that you love it more! So why did you write a new book? Code Happy covered the version stretch between 3.0 and 3.2.x, and with nearly three thousand copies sold I must have done something right. 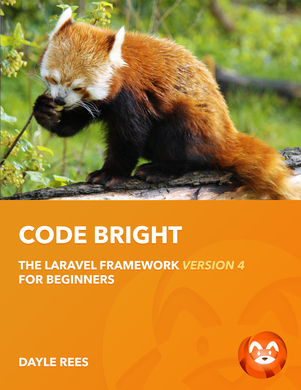 Sure, I could have probably re-worked the entire book to work with Laravel 4. However, this version of the framework is reinvention. If I was to update the book you would lose all the information about version 3 which I believe is still great framework. Many people will have large projects based on Laravel 3 and I think that they should have access to the information in Code Happy if they need it. Then there's my own experiences. I have learned a lot about writing a book since finishing Code Happy. I have learned about my common mistakes, which I can now avoid. I can improve on what I have already done, and I hope to do so. I didn't read Code Happy! Should I read that first? You can if you want to, I put some funny jokes in there. However this book is one for beginners, and so we will start from the very basics. If you have already been using Laravel go ahead and skip to the interesting bits to see what has changed. If you are new to the framework then I would suggest you stick with me and read it from cover to cover. Don't worry! I will try to keep it interesting. Soon you will be building wonderfully expressive PHP applications with Laravel. When will the book be complete? As with my previous title, this book is a published while in progress title. It means that you get each chapter as I write it. In its current state the book may not be complete, but as I add additional chapters you will receive an email and will be able to download the updates for free. I feel that this method of writing offers a great deal of flexibility. I can be relaxed about my writing knowing that I can change something easily if I have got it wrong. By not rushing to hit a deadline I can write a book that I feel will be of greater quality. I can update the title for future versions, or to highlight additional information. You will be able to access the content faster. It also allows me to release the title alongside the launch of the new version of the framework. I have run out of questions..
Good! By now you should be eager to start the learning process. Jump right in and start enjoying Laravel. Feel free to send me a tweet or a message on IRC if you want a chat!